Following on from the future of local transport debate the other evening, I would like to propose a simple parking experiment. It would not cost much and should be fairly straight forward to carry out. I suggest that the council gets four or five Car Bike Ports, puts them in parking bays around the city, and then monitor what happens. If you were to leave them in a single bay for no more than a few months at a time, you would only have to use Temporary Traffic Regulation Orders (TTROs). Or you could have them moved between bays on the same street every few days, so that you would even need to bother with the TTROs. 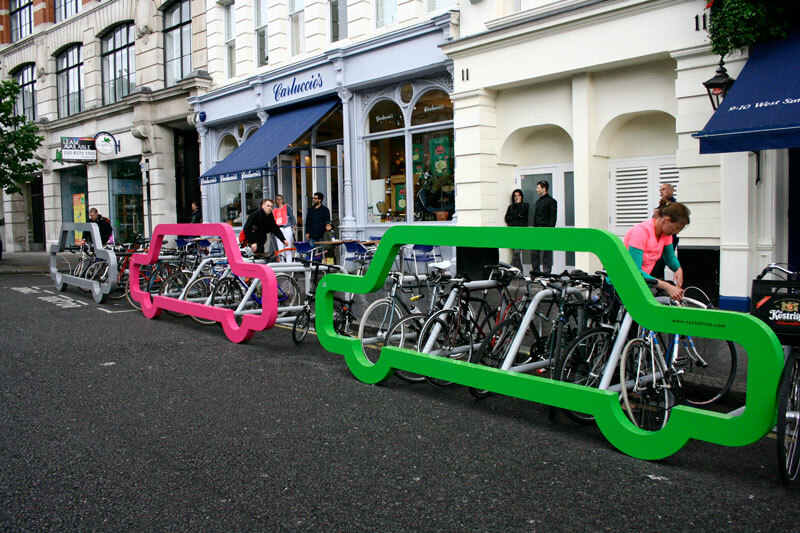 As it is purely short term experiment there should be to much planning needed and as the Car Bike Ports were originally commissioned by the London Festival of Architecture, the Street Scape people shouldn’t have a problem. The Car Bike Ports could even be rented to keep the cost down. Although I suspect that by the end of the experiment there would be a clamour from the local trader for keeping them. So are you wiling to give it a go? Back in 2001 I worked with Simon Nuttall on cycle parking & security projects for Cambridge and Hackney, with the former trialling various types of parking units and the latter doing a loose demand analysis to decide where to locate initial tranches of cycle parking stands, and how to make them ‘locally appropriate’ with branding, combination with street signs etc. In 1995 the Glasgow project set off and with Allan McLean I drew up a base spec for tendering to – to avoid suppliers cutting corners to win on price by making the metal thinner/paint less good etc. This is perhaps a well documented project that has certainly delivered substantial increases year on year to bikes coming in to Glasgow and being parked – one site has see growth from 1 bike to over 48 bikes in 18 years, and figures of 30+% growth year on year were being recorded. Edinburgh has not to my knowledge followed suite with a programme like Glasgow’s and the copying of that programme by Hackney. Essentially Glasgow budgets to install 200-300 stands per year, and is now installing covered on-street parking at popular locations. Stands are to a standard design in black (coated nylon finish – or was) and stainless steel, with a tapping rail to avoid blind users missing them with a cane or guide dogs from walking underneath. Some units are used to replace older stands others go in as new locations where a need has been identified. Locations such as CCA and GFT often see stand overload at night – often filled to 200% of design capacity. Stands go in and fill up with bikes, and that sends a subliminal message to those who are thinking about cycling – “There are bikes like mine parking here, there are people like me cycling to town”. Hope it works. I can just imagine the howls from our local councillors if anyone dared to suggest anything like this. Actually I thank they would probably laugh in our faces and make rude comments about people being naive. That’s what happened last time.